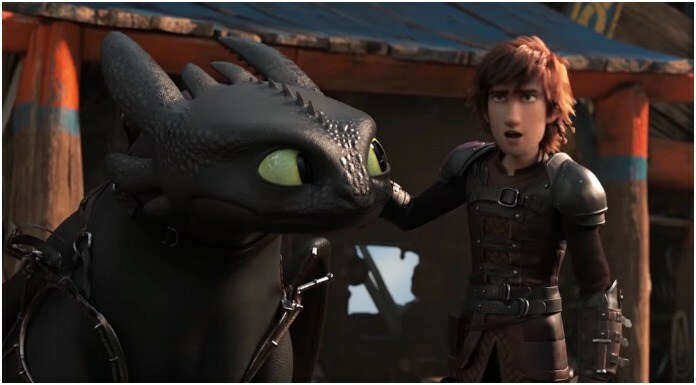 Dreamworks has officially dropped the trailer for the highly anticipated third installment of How To Train Your Dragon. The forthcoming chapter titled the Hidden World, is set to see Jay Baruchel, America Ferrera, Jonah Hill, Kristin Wiig, T.J. Miller, Gerard Butler, Cate Blanchett, Craig Ferguson, Christopher Mintz-Plasse, Kit Harington and Djimon Hounsou reprising their roles. There’s no further information about the storyline, but from the trailer, we do know that our favorite dragon, Toothless, will be getting a girlfriend in the third film. We can’t wait to see all the cute moments, but we couldn’t help but realize he’s a bit awkward and totally all of us around the person we like. How to Train Your Dragon: The Hidden World will make its theatrical release on March 1, 2019. What do you think of the trailer for How To Train Your Dragon: The Hidden World? Let us know in the comments below!